So cute Annie! I have a vintage bobbin like that and a billion buttons from my mom and grandma. I use my bobbin to wind binding and put it on the extra spool holder on my machine when I’m putting bindings on my quilts. Those are darling scissors holders Annie. I put my scissors in an empty plastic cone thread and glued yarn all around the outside. Not so cute and because it was plastic, not heavy enough to keep from tipping over. I thought of adding a weight on the bottom, but those wooden bobbins are so much nicer! I have large wooden thread spools that might also work. Thanks for the inspiration. What a wonderful life you have given to these bobbins. You did a fabulous job on each of them. Great that the trinkets all have such terrific family story lines. Love the special-ness of these! I also love your thoughts about no clutter, something I'm striving for so I needed the reminder. 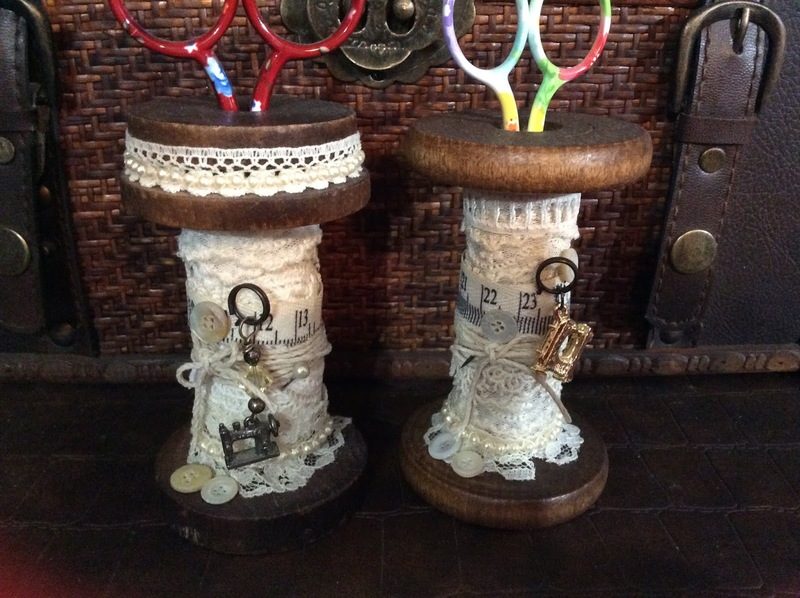 What a great idea for your vintage bobbin and mementos. I'm sure your friend loves hers too! I know what you mean about trying not to keep clutter and only the things that have meaning to you. I struggle with that if I thi k it has a crafty use.... but I've gone through downsizing the stuff in the rest of the house the last several years... although I could really do a lot more, I'm sure.. It's good when you can change something that's been around for a while into something both useful and interesting. These are very pretty and useful, what could be better and I'm sure your scissors like their lacy-wooden resting place. oh, I hope this will be my inspiration to reduce clutter . . . But I just can't part with all the necessities! Check out my thank you on flickr!!!! Who doesn't love comments and inspiration? !